I would never go round to a friend’s house for dinner and state “you’re a really great cook, you must have a really good oven!” All too often however, I hear people state when we are diving, “wow, you guys have a really good camera, you must take some great shots!” The simple truth is that taking photos underwater is not easy and the camera that you use is only one factor in many that are required to take great shots. With the onset of the digital revolution, underwater photography is becoming increasingly popular and accessible to divers. From tiny GoPro cameras on sticks to DSLR rigs that look like they could land on the moon, the technology is everywhere. To be honest, it concerns me! I am certainly not qualified to write an article on underwater photography. However, I believe that as a minimum starting point, photographers need to have adequate buoyancy control and I feel that I am qualified to talk about that! Divers will never achieve good buoyancy without practice and a conscious effort to actually think about buoyancy (visualisation). There is, of course, no substitute for spending hours in the water. Once you have nailed your buoyancy and are able to maintain buoyancy at any depth, without kicking or skulling, then, and in my opinion, only then should you consider taking up underwater photography. Until then, whilst you may be able to get away with a small point and shoot or GoPro camera, please don’t invest in a large rig, you simply are not ready for it. If you take the plunge into underwater photography with a small rig or GoPro before you are appropriately skilled, be aware of your limitations. Compensate for your buoyancy skills by being over cautious in your interactions with the underwater world. Whilst you may not “nail the shot”, take account of your limitations by not getting too close to the coral or delicate substrate and avoiding potential damage. Practice your photography skills over sand, remaining very still in your hover position to avoid stirring up the bottom. Not only is this good practise, not disturbing the sand is also essential to avoiding backscatter in your photos. Only when you can consistently shoot bottom dwellers in a motionless hover position with no kicking or bottom contact should you consider moving on to taking shots over coral or more delicate environments. When diving over sand, such as when you are muck diving, it is a great idea to have a stainless pointer in one hand, to steady yourself without needing to touch the sand with your hand and to gently push off once you have taken the photo. Swimming backwards with your fins is also a very useful technique but takes a bit of practise. And to all those GoPro users out there, please do not chase or harass the wildlife. I’ve seen too many divers and snorkellers do it! Great footage takes time and patience and, of course, a little bit of luck sometimes! Footage of a relaxed animal who has become used to you as a diver by time and patience will always be better than footage of an animal being chased and rapidly swimming away! 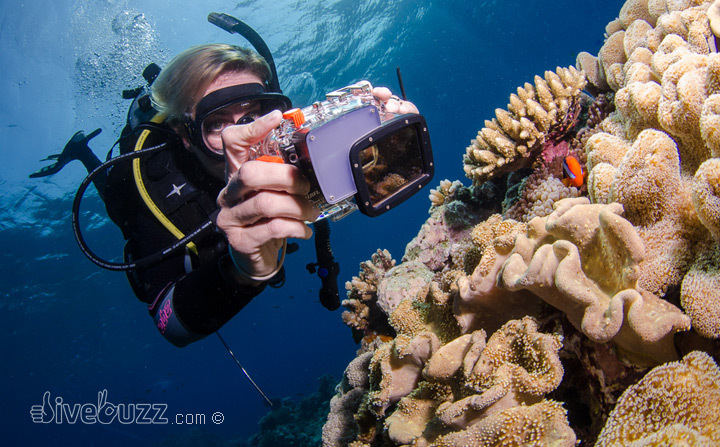 Once you are comfortable with your dive skills and buoyancy you may want to consider upgrading to a larger, mirrorless or DSLR system. These set ups including arms and strobes can be very large and difficult to handle and will, of course, take some getting used to, no matter how experienced a diver you are. Bear in mind that such a rig will affect your buoyancy. Some set ups will be significantly negatively buoyant in the water and you may want to offset this with floats to make the set-up more neutrally buoyant. Also consider task loading, yes, even experienced divers can panic. You will need to be competent and confident in the water before taking on the added task loading associated with a large camera. With an expensive set-up, the last thing you will want to do is dump your gear, so you’ll need to be skilled to handle a large set-up competently in less than favourable conditions. Of course, if the proverbial does hit the fan, your life is more important than a camera and don’t you forget that! So there you have it, my view on underwater photography and minimum buoyancy requirements before you make your investment. Once you are appropriately skilled and have made the investment I wish you all the best with your shots. In fact, feel free to share them with us over on our Facebook page! Remember, however, a good cook does not only need a good oven… There is a long journey ahead in order to get a great shot, regardless how good your buoyancy skills are and how good your camera is! What’s your view on underwater photographers and buoyancy? Do you have any stories to share on the subject? Do you dive with a camera and if so, how many dives had you done before you started taking photos? We would love to hear your feedback.